Every other year the members of IC pair up with musical artists. The seven teams (there are seven IC members) are tasked with writing a new song and performing it at the festival. The songs are subsequently released and sweep the charts. Then a bunch of people complain about the IC songs taking the spotlight away from other artists (the revenue from the music sales all go to charity, so um, I kind of groan at all of the hating that happens). Wait two years and repeat. The IC song festival has become such a big event other artists try to avoid releasing music when the festival occurs – because they know they will not outrank the songs that are produced by the IC Music challenge. This year saw some interesting pairings, with BOA and Gil as well as Yoo Jae Suk and Yoo Hee Yeol teaming up. 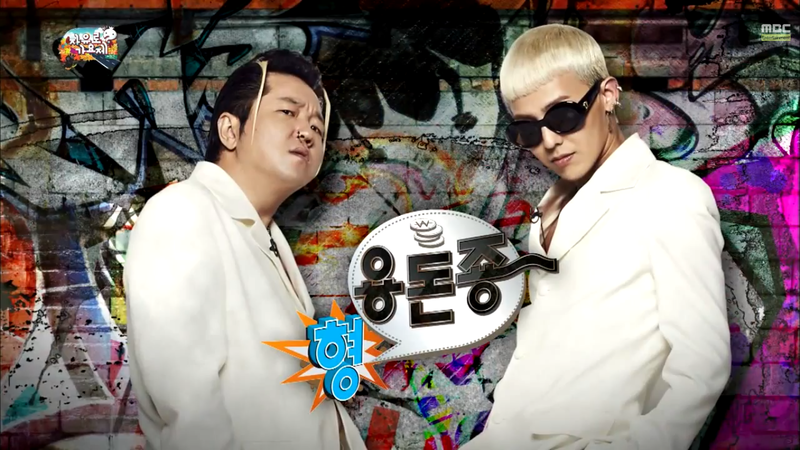 But the highlight of the music festival in my opinion was the one true pairing of G-Dragon and Jung Hyung Don. If you have not watched these two you are missing out on some greatness. Hyung Yong Don Jyong greatness (that is their team name, it translates to Hyung Give Me Allowance. Haha). These two with their push and pull and their shopping and their….I just…love them! 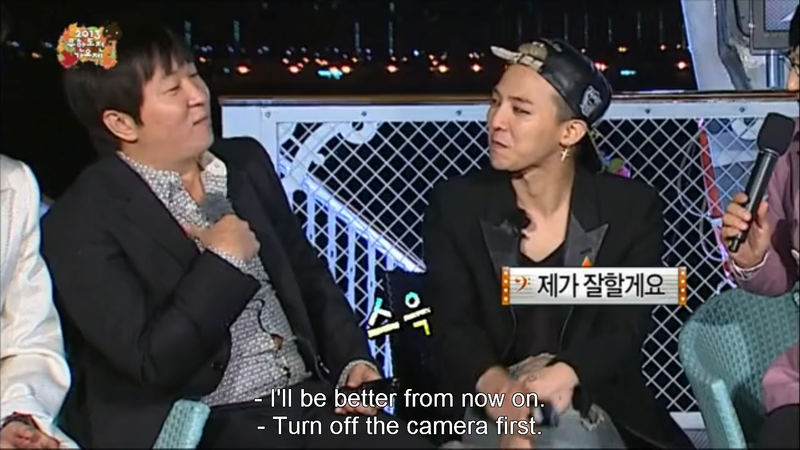 Henceforth are the reasons I strongly support G-Dragon and Jung Hyung Don winning MBC’s couple of the year award. Hyung Yong Don Jyong fighting! 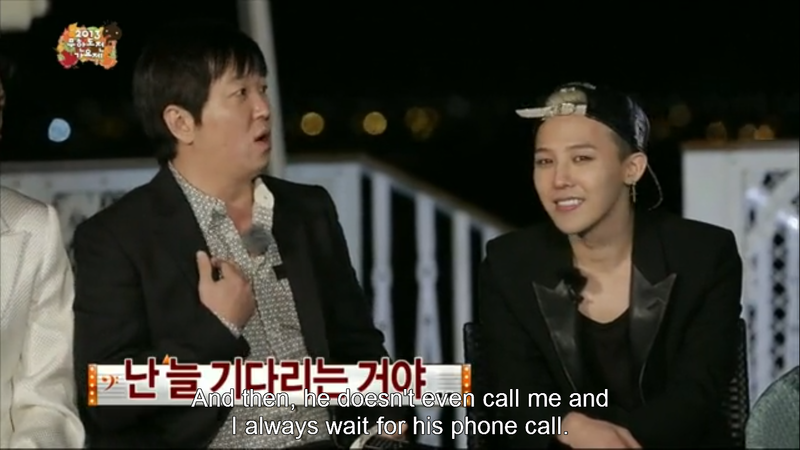 Jung Hyung Don has often pointed out that the only thing G-Dragon is missing is style sense. So of course, Hyung Don has taught the kid a few tricks through leading by example. I think G-Dragon may learn something about fashion from his hyung after all. Finally! Note sarcasm here. Yes, they have couple rings. Nuff said. He loves me, he loves me not. G-Don knows how to play this game, but never fear because it always ends up adorably. Yes, that is Hyung Don picking through a pile of clothes in Dong Myo to find costumes. Yes, that is G-Dragon shopping with him. It is precious to have the type of relationship where you know you will only improve if your partner is there– hence why G-Dragon and Jung Hyung Don remade G-Dragon’s Crooked music video. Because with the two of them it is all that much better. They are already lobbying to win MBC’s couple of the year award. Wouldn’t it be sad if they lost? After the performance, G-Dragon stated in an interview, “Hyung Don hyung has his eye on the Best Couple Award.” Jung Hyung Don asked, “Are you going to come to the awards ceremony?” G-Dragon answered, “If we get the award, I will,” evoking laughter (Soompi.com). During an episode of Infinity Challenge all of the Music Festival teams got together to discuss their progress and have a little fun. 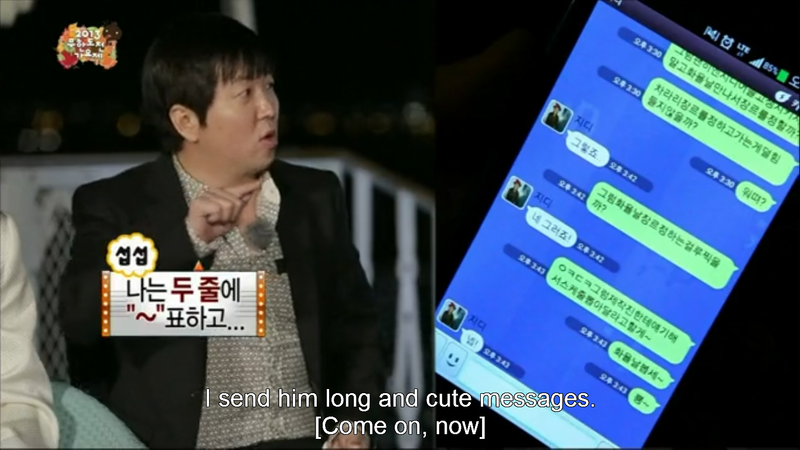 For Jung Hyung Don it gave him a place to voice his complaints towards G-Dragon for ignoring him. G-Dragon apologized and the two made up, but not after they left the rest of the cast laughing (and wondering what was going on). 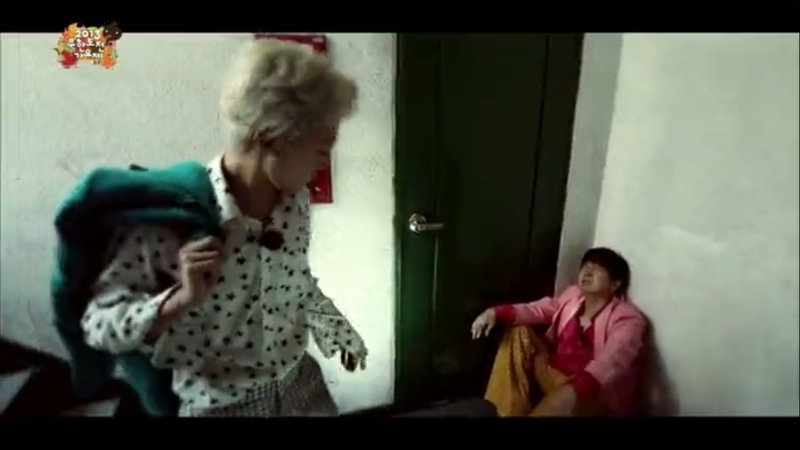 Hyung does not like it when G-Dragon wears shorts and G-Dragon does not like when Hyung looks at other people. Creepy? Kind of. Funny? Extremely. 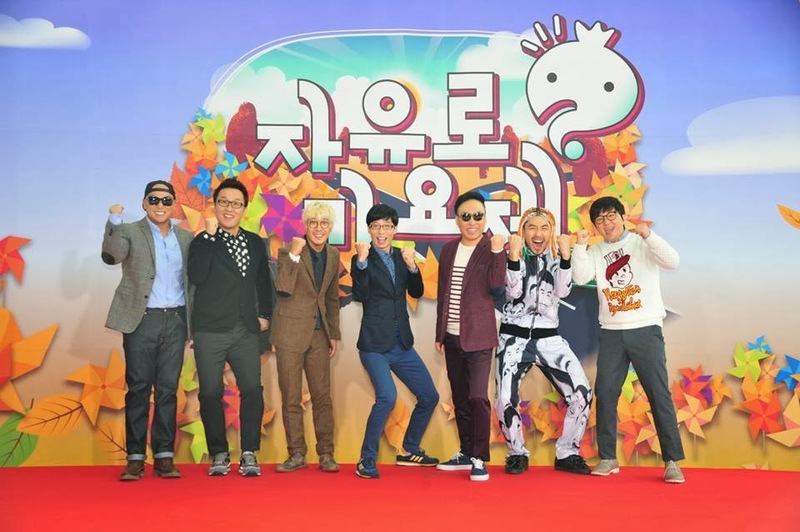 Hyung Yong Don Jyon gave an amazing performance of their song “Going to Try” at the Music Festival, complete with Defconn dressed as a pigeon. Can a television show get more awesome then this? I think not. 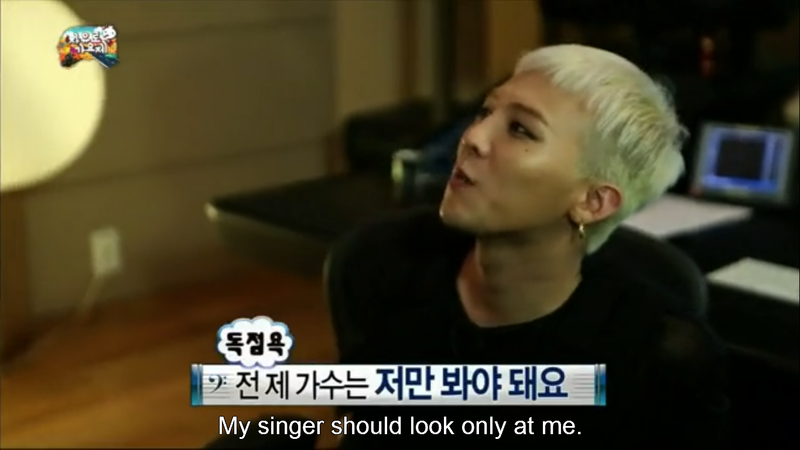 try at bigbanglovers site they have subbed ep. Their bromance is so funny! They so deserve the couple award :).